For live work, jamming and using as a musical sketchpad, Cantabile 2.0 Performer is indeed in our top ten. Less flexible than other hosts. Many gigging and touring pros have taken to using notebooks or even desktop computers on-stage, and why not? With all of the brilliant soft synths, samplers and effects, a laptop can replace racks full of gear and, in theory, reduce the stress that goes with managing a live rig. However, a live software setup must also be manageable, to withstand life on the road. With the Windows-only Cantabile, Topten Software seeks to give you everything a performing musician might need in a plug-in host, with none of the studio-centric bloat that weighs down most DAWs. More than that, the developer has provided tools aimed at maximising integration between your MIDI hardware and plug-ins. Cantabile isn't a traditional plug-in host, so don't expect it to do any DAW-like editing or arranging. What's more, there isn't a single synth or effect in the package, as Topten is leaving the VST-stockpiling to you. 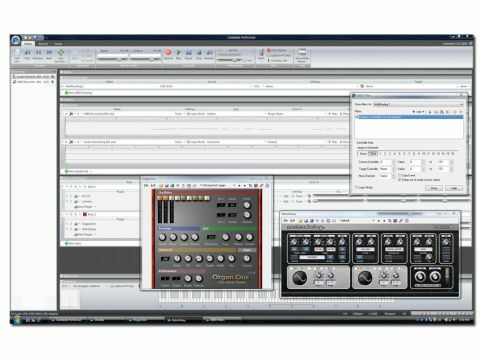 What Cantabile does is provide a thoroughly customisable workplace, with racks for your VST instruments and effects, and a means by which they can be routed to your hardware MIDI and audio interfaces, as well as each other. It gives you quick and easy access to the most important mixing parameters that you might need at a gig, such as each plug-in's gain and pan settings, presets and wet/dry levels. "What Cantabile does is provide a thoroughly customisable workplace, with racks for your VST instruments and effects." These functions are provided in 'racks' rather than in a familiar mixer setting, and you can stack up rack upon rack as you need to. Instruments and effects are loaded into racks, and the racks themselves can be soloed, muted, bypassed and record armed - you can also use them to process incoming audio signals. This method is flexible enough for just about any plug-in combo that you can imagine, though it's not as freely patchable as a fully modular plug-in host, such as energyXT2.5 or Plogue Bidule. As you'd expect from a product aimed at live performance, Cantabile's MIDI implementation is very flexible. Just about any parameter on show can be assigned to virtually any MIDI controller. For example, plug-ins can be bypassed with a single key tap via the Note to Controller Assignment, or multiple racks can be spread across the key range to create complex splits and transpositions. In fact, you can filter any incoming MIDI data or reroute it as needed. 'Triggers' can be defined, to control external devices whenever you perform certain actions, such as loading a new session. VST parameters can be controlled via MIDI, too, and you can switch sub-sessions via MIDI program changes. "Though we've stressed that Cantabile is not a DAW, it can record and play back audio and MIDI, making it a good sketchpad for generating ideas." So what's a sub-session? Well, Cantabile's settings are stored as sessions, and a sub-session is a named variation within a session. For instance, a session might contain a selection of racks with their own instruments, effects and routings - a variation of that session using the same plug-ins but different mutes, program banks, MIDI triggers, routing entries and sync options could be saved as a sub-session for fast recall. This is assuming that your plug-ins don't have long patch-load times, which is beyond Cantabile's control. Though we've stressed that Cantabile is not a DAW, it can record and play back audio and MIDI, making it a good sketchpad for generating ideas that can be tweaked in a separate editor. Performances can be saved, too, as it can record the output of plug-ins, as well as incoming audio. As for recording, this can be engaged manually or set up to start automatically when Cantabile receives MIDI data or audio above a predetermined threshold. Recordings can run in sync to the master clock or be triggered individually. WAV, MP3 and MIDI files are supported, too, although there's no timestretching of any kind. Although Cantabile is intended for live performance, it has a few features that are more at home in the studio than on the stage. Some of the most inspiring aspects of these are the morphing and randomisation tools located at the top of the individual plug-in editors. They aren't unique, but they are to-the-point. There are three such tools, including Randomize, Randomize Between and Morph, with a masking feature that enables you to choose which plug-in parameters are to be affected and which should be left alone. Randomising is accomplished simply by clicking on a dice icon, and there's a slider to adjust the percentage of variation that should occur. "Although Cantabile is intended for live performance, it has a few features that are more at home in the studio than on the stage." You can also automate the process via the Animate button - activating this will cause Cantabile to randomise a plug-in's parameters at set intervals, so that you can sit back and wait for something to take your fancy. You can exert some control over the randomisation process with the Randomize Between mode, whereupon the program will generate random presets that lie somewhere between two selected patches. Lastly, Morphing is a variation of this, but without the random aspect - instead, you select two patches and simply use a slider to blend between the two. Cantabile is a powerful and deeply flexible program. In practice, it performs well, and though we did crash it once during the review period, it wasn't a repeatable problem. Multicore support means that it went easy on our machine, and 64-bit Windows users will be glad to know that there's a version for them. It's true that there are a handful of dedicated plug-in chainers and modular hosts out there, and some of them make fine live performance tools. However, Cantabile was designed from the ground up for live performance, and it shows. Frankly, we'd be hard pressed to conceive of a live scenario that Cantabile couldn't enhance. It's not for everyone, but if you're a performing musician looking to maximise the live experience, you really should try it out. Note that there's a cut-down version, Cantabile Solo, which lacks sub-sessions, triggers and the MIDI routing table.